When it comes to thermoforming, manufacturers should look for a UV ink that offers good adhesion, surface resistance, and longevity. In this week’s exclusive editorial, we discuss how UV inks are making headway into thermoforming. Editorial Mission: To provide a practical guide for manufacturers embracing advancements in industrial printing. Packaging, textiles, decorative laminates, tiles, electronics, and other industrial print markets are experiencing disruptive technology changes. 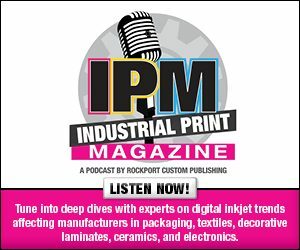 Industrial Print magazine provides unbiased editorial offering product reviews and application stories that provide insight within this dynamic market. Copyright 2018 Industrial Print. All rights reserved.